Since we had Thanksgiving at a friend's house, we are doing our own Thanksgiving: The Sequel and roasting the turkey today. What's Thanksgiving without leftovers? Blind-Baking: Fill crust with pie weights or beans on top of a piece of parchment and bake at 400° for 10 minutes. Brush with beaten egg or glaze and bake another 5-10 minutes. Pumpkin Filling: Whisk all the ingredients together in a medium bowl. Set aside. 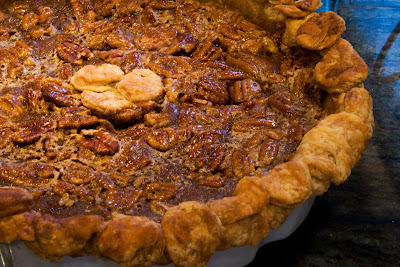 Pecan Filling: Whisk all the ingredients together in another medium bowl. Set aside. Place a bowl and beaters in the freezer for the whipped cream. Turn down oven to 350 °. Gently pour pumpkin filling into the pie shell and spread evenly. Gently spoon pecan filling on top. Bake until a knife comes out clean, somewhere between 40 min and 2 hours (my pies always take twice as long for some reason....probably just to make the Thanksgiving prep more stressful). If the crust is browning too fast, tent with foil. When done, cool on a rack. Meanwhile, beat cream, sugar, vanilla and bourbon in the (freezer chilled) bowl until it holds soft peaks. Serve pie with the cream. Mix flours together with salt. Add butter to flour mixture and toss to coat butter pieces. Put in freezer for 10 minutes. Dump the flour-butter mixture on a CLEAN cool counter and roll over it with a rolling pin to flatten the butter lumps. Scrape off the butter that sticks to the pin. Quickly scrape dough together and roll over again. Repeat one more time, then scrape back into the bowl and place in the freezer for 5 minutes. Shape into a ball, cover with plastic wrap and refrigerate for at least 30 minutes. Divide in dough in half and flatten each half into a 3/4" thick disk. Refridge or freeze one disk for later. Lightly flour counter, reserving a small pile of flour on the side. Place the rolling pin in the center of the disk you're using and roll to one edge . Rotate the disk 45 ° and repeat until you get a 13" round. If it's sticking, drag the disk through the reserved flour as you rotate. Once you've gotten the size/thickness desired, lightly flour the top of the dough, fold in half, then fold again. Sprinkle the graham cracker crumbs on the counter and unfold the dough on top. Gently roll over the dough to get the crackers to stick. Then fold into 4 again. Lay into your pie dish and unfold. Trim the edges and fold the 1/2 " overhang under to crimp. Place in the fridge for 30 min./ freezer for 10 minutes. 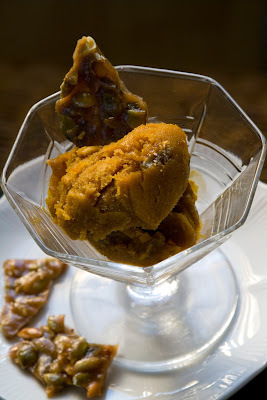 This is the spicy pepita brittle that I crumbled into my Pumpkin Sorbet. It's also great on its own. You can also omit the chili flakes if you don't like it hot. 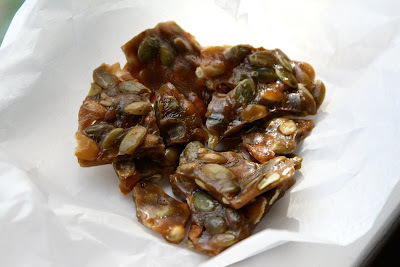 Making candy is pretty intimidating to me, partly because having to use a candy thermometer requires more precision than I'm built for, and partly because when the recipe says "don't shake or stir" all I want to do is shake and stir. In hopes of changing my ways, I recently forced myself to read up on why it's important to follow the directions, chemically speaking.... basically, with brittles, you don't want sugar crystals to form. So you have to take precautions to prevent "seed" crystals from starting an epidemic. That's why you wipe down undissolved sugar from the sides of the pot and don't stir, even if you're dying to. Adding corn syrup (glucose) adds diversity and prevents table sugar (sucrose) from forming cliques. It's not that tricky, really. It is very very burning hot, however, so be careful not to touch the hot candy and keep children (and those with poor impulse control) out of the kitchen. 2. Spread the pepitas on a baking sheet and roast until lightly browned, about 5-7 minutes. Remove them from the oven, turn the oven to 150° and leave the door open to let it cool down. Stir the 1/2 T butter, salt, pepper flakes and cinnamon into the nuts. Then put the nuts back in to keep warm. 3. Line a large baking sheet with foil. Butter and spray. Spray a couple of forks and a spatula too. 4. Combine the sugars, syrup, and water in a heavy unlined pot over medium high heat. Stir with a wooden spoon until the sugar is completely dissolved. Remove from the heat and wipe any grains of sugar from the sides of the pan with a wet pastry brush. Place the pan back on the heat and clip on your candy thermometer. Bring to a boil. DO NOT stir or shake. 5. Meanwhile, in a separate bowl, mix baking soda, vanilla, and the 1/2 tsp water. 6.Boil syrup to hard-crack stage 300°-310°. Stir in the 4 T butter. Keep cooking to bring the temperature back up to soft crack 270 ° -290°. Remove from heat. Stir in the soda/vanilla mixture and stir for 30 seconds (it will foam--don't worry). Stir in the warm pepitas until they are all coated. 7. Pour onto the baking sheet and use the sprayed forks to pull the candy as thin as possible. When it's cool enough to handle, use your fingers to stretch it out more. Let cool completely and then break into pieces. "Okay, let's look at the problem this way: imagine I had a pizza and then all my friends showed up so I cut it into 100 slices. Then imagine I ate 50 of the slices and..."
I never pictured myself trying to teach elementary school math, especially after my traumatic experience learning it. Turns out it's not all that bad... and I'm realizing that there's probably no good reason I've felt haunted by long division all these years. (I'm tempted to seriously digress and make this post about how telling kids they're bad at math creates a stigma that murders dreams...but it's going to be about pumpkin.) The upside of being "bad at math" is that all those years of trying to make it quick and painless has made me an empress of shortcuts and tricks. Now I get to be the one who sits down with my frustrated students, hides those daunting zeros with my thumb, and whispers, "I'll let you in on a little secret..." Even though a page of numbers still automatically gives me the chills, time has brought me enough clarity to know that with math, like most things, it helps to have an alternate strategy and an escape route. So when I decided to make a pumpkin sorbet and discovered the apparent dearth of pumpkin sorbet recipes on the internet, I had to get out my algebra cap, the kitchen scale, and a bottle of Wild Turkey just in case (I'll explain this in a minute). 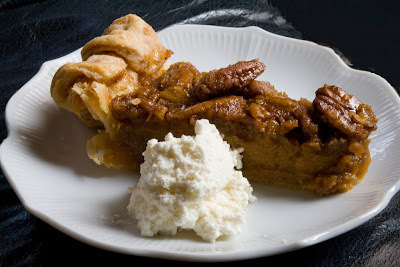 I've been thinking about alternatives to the heavycreamycustardy pumpkin desserts that dominate this time of year. Also, I've been trying to think of a way to have non-dairy frozen desserts for those of us who can't or don't want to have dairy. I'm not crazy about dairy substitutes--to me, the idea of making pumpkin pie with non-dairy creamer or silken tofu seems blasphemous (but that's just my opinion). Sorbet seemed the obvious solution. So if you check my math (and know that the weight of a cup of white sugar is 7 oz, a cup of water is 8 oz, and the weight of a 15 oz can of pumpkin is, well, 15 oz) you'll see that I rounded. With gusto. This is the trick, the safety net. Different sugars inhibit freezing by varying amounts, and eggs whites create lightness. A few spoons of alcohol also lowers the freezing point (ever seen a tequila ice cube? Didn't think so) and a little booze never hurt any dessert. 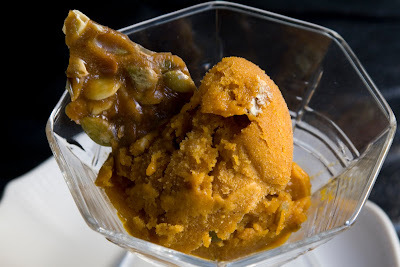 This sorbet is definitely scoop-able and intensely pumpkin-y (maybe even too pumpkin-y for some.) I like it both pie-spicy and hot-spicy and the hot-spicy pepita brittle adds a kick and a crunch. 2. In another bowl, combine pumpkin, syrup, spices, vanilla, bourbon, and lemon juice. Add in the sugar/water mixture and chill completely or overnight. 3. Add to your ice cream machine and follow manufacturer's directions. Or still freeze. After the first 5 minutes, add in the beaten egg white. 4. 5 minutes before the sorbet is done, add in the crumbled brittle. Pack into a container, cover with wax paper and pop in the freezer. I admittedly was not a brussels sprouts fan until I heard the Border Girls on the radio lauding shredded brussels sprouts. 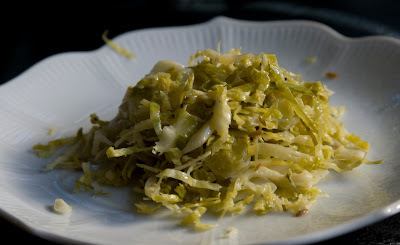 Basically, I learned that the quick cooking time of shredded sprouts eliminates the possibility of releasing excessive sulfur compounds (sinigrin) which are bitter and stinky and convince people that they dislike brussels sprouts. With some excellent exceptions, I think most brussels sprouts I've had were attempting to mask their overcooked- cabbage taste with copious amounts of bacon and butter. Not that there's anything wrong with bacon and butter. This recipe, in contrast, is a lighter, fresher tasting alternative to the heavy/ maple-y brussels sprouts that tend to be served this time of year. In large bowl of cold, salted water, soak brussels sprouts 10 minutes. Drain; trim ends and discard any bitter outside leaves (be brutal!) Cut each sprout in half lengthwise; thinly slice crosswise on a mandolin or with a good knife. You can also do this with the slicer disk of a food processor. In a large skillet, over medium high heat, melt 2 T butter, cooking until foam subsides. Add half of cumin seeds, half of the sprouts, 1/4 tsp salt and 1/8 tsp pepper; cook over high heat, saute stirring occasionally 3-5 minutes or until sprouts start to brown and are crisp-tender (don't overdo it.) Transfer to a bowl and do the next batch the same way. Transfer the second half to the bowl and stir in lime juice. In the fascinating book, A Drizzle of Honey, authors David Gitlitz and Linda Kay Davidson explore the food customs of the conversos -- Spanish Jews who were forced to convert to Catholicism during the Inquisition. The courts of the Inquisition were fond of using civilian "spies" to discover Jews covertly still practicing their rituals--often culinary--even though they had converted. A Drizzle of Honey offers a collection of court testimonies and recipes (though way too medieval to be appetizing now) used to turn in these secret Jews. This article gives a better description than I can of this subject. Funny how something as seemingly benign as huevos haminados was probably a dangerous thing to be cooking... Thankfully the dish survived the Inquisition. Which is a good thing because eggs cooked this way are creamy textured, almost caramelized and gorgeous. I know plenty of people who are turned off by hard-boiled eggs--probably from eating chalky, rubbery, and stinky ones. 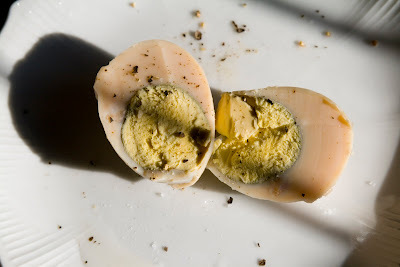 Cooking eggs for too long and at too high a temperature causes the the formation of hydrogen sulfide (stinkiness) and ferrous sulfide (that telltale green ring). As Kenji of Serious Eats shows with experiments, a couple degrees and a couple of minutes can make a big difference with hard-boiled eggs. The beauty of huevos haminados is that you don't have to worry about all that. The eggs go in a pot on the stove or in the oven...or in this case, a crockpot, and cook at a low temperature overnight--a few minutes more or less won't make any difference. 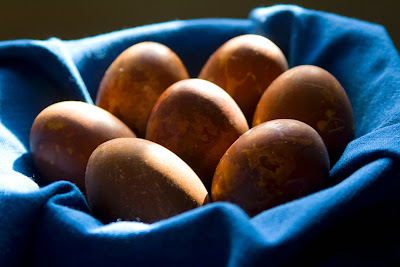 Those times when we would have these dark brown eggs for Passover always felt special. I assumed that there was a lot of work involved to make eggs this way but that simply isn't true, especially with the slow-cooker. Now I make them all the time to have around as breakfast or a quick snack. They also look beautiful halved in a bean salad. I collect onion skins in a bag in the freezer, but you can ask your grocer for some extra skins. Put the onion skins in the slow-cooker and then nestle the eggs in, covering them. Cover with cool water. Add the tea, vinegar, oil, and peppercorns. Cook on High for about an hour then turn to Low for another 8-10 hours. Remove eggs and cool in ice water. *You can make these on the stove top: in a pot, bring to a boil, reduce heat to very very low, cover the pot well and simmer for 6 hours, adding water as needed to cover the eggs. My dad has given me two perfect gifts. Both were unusual and prophetic, their potential unfolding over time. The first was a hypnotic poor-quality video tape of a sewer blockage that my dad managed to get from a (probably bewildered) plumber. It was perhaps a strange care-package to mail to a daughter at college but it ended up being a source of inspiration years later. The second gift was a cookbook that my dad rescued from a bin at the recycling center. Printed in 1960, "In A Persian Kitchen" looks its age. The jacket is in tatters, the bottom corner must have had a run-in with a khoreshe, and the recipes are full of advice for aspiring "Persian housewives." I came into possession of this book before I ever thought I'd live in Irvine, with its plenitude of Persian food. In fact, it was before I even cooked much. I had just moved into a shabby apartment in Westwood where I had the first kitchen that was really mine. The kitchen came complete with a "vintage" oven that, despite the deceiving adjustment knob, only had one temperature--burn. This presented quite a challenge and a challenge I ended up devoting a lot of free time learning to conquer. So, "In A Persian Kitchen" was one of my first cookbooks and was my guide through many fledgling cooking experiments. While many of the recipes were similar to other Middle Eastern dishes I knew well--eggplant casserole, yogurt dip, stuffed cabbage leaves--many others seemed exotic to me at the time--pomegranate soup, rice and rhubarb sauce, stuffed quince. As the author notes, the way Persian cuisine combines fruit and meat often strikes the American palate as unusual. I was totally intrigued. I entertained often during my time in that apartment. Fortunately, a neighborhood of hungry college students who weren't put off by the likelihood of the place going up in flames made a fantastic audience. Being a beginner in an ill-equipped kitchen, most of my early attempts were failures, including my take on her stuffed quince recipe. I didn't cook much from that book after that year, though it was a catalyst to a building interest in Middle Eastern flavors. Also, while dated and in contrast to everything I had been hearing in my Women's Studies classes, the housewife wisdom woven between recipes managed to stick with me. 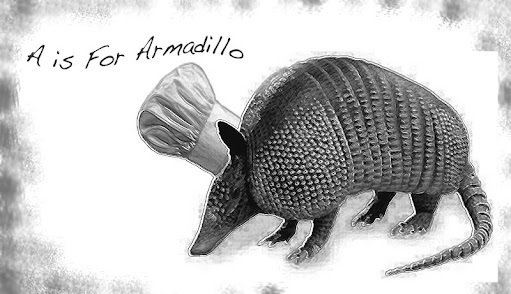 The author urges the cook to be exceedingly hospitable, always prepared to stretch the stew at the last minute. She introduces the book with a proverb that I was especially drawn to: "a guest is God's gift." 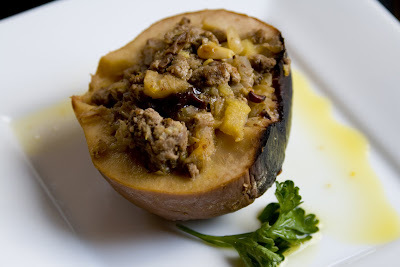 Now, five years and many ovens later, meat-stuffed fruit seems less surprising and more manageable. Quince was on my New Year's list as the "new fruit"--eaten for the first time that season as a celebration of the fall. For my parents, who joined me for this, eating quince this way was very new. Quince is often found in jams (has lots of natural pectin!) and tarts but is also good as a savory dish. They are apple-like and can take a while to soften when cooked. This recipe is not from the Persian cookbook, but is my fusion of pan-Middle-East of interpretations of the dish. I did keep the sweet-and-sour accent from the Persian recipes and used the pre-baking style from Claudia Roden. Wash the quinces and rub off their fuzz. Bake on a foil- lined baking sheet at 325° for about 1 1/2 hours until they give a little when you press. Heat the oil in a pan and fry the onion until it is soft. Add the meat and tomato paste and cook until browned. Add in the pine nuts, raisins, cinnamon, allspice, and 1 tsp. pom molasses and cook for another minute or so. Season with salt & pepper. When the quince are cool enough to handle, slice them open lengthwise. Remove their cores. Then, using a spoon or melon baller, remove some of their flesh, leaving at least 1/2 inch in the shell. Add the removed pulp to the meat stuffing mixture. 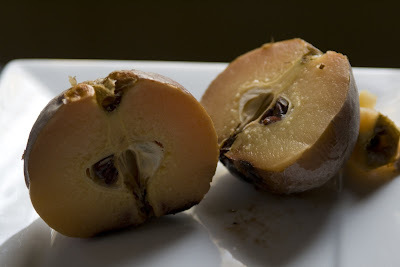 Place the quince halves in a baking dish and rub the inside of each shell with about 1/2 tsp brown sugar. Fill the halves with the stuffing. Dissolve the saffron in the water and mix with the lemon juice, remaining molasses, and T of sugar. Pour this mixture over the fruit and drop in some dots of butter, if using. Cover the dish with a lid or double layer of foil and bake in a preheated 350° oven for about 1/2 hour more.